76ers center Joel Embiid was determined to live up to his nickname Friday against the Hornets. Fortunately for Philadelphia, he did, and the Sixers prevailed 133-132 in overtime. The 76ers needed all 42 points and 18 rebounds from the player they call "Clutch," after Charlotte rallied from a 21-point third-quarter deficit to almost steal a win on the road. 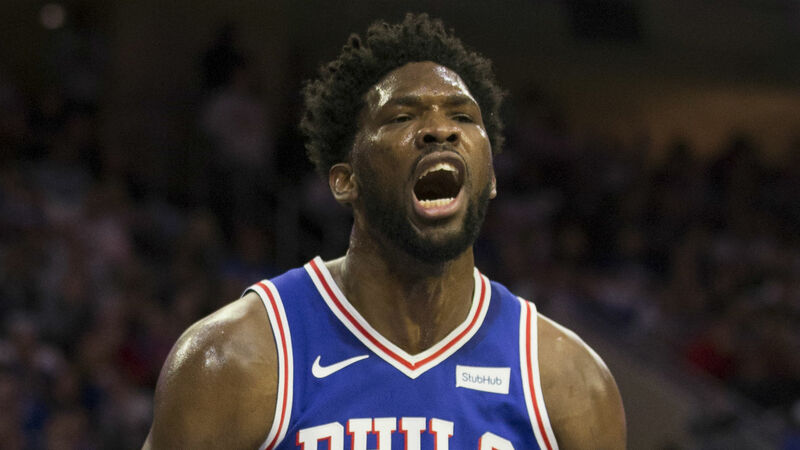 Embiid drained a game-tying 3-pointer with 34.4 seconds left in the fourth quarter and was 14 of 16 from the free-throw line in the fourth quarter and overtime to keep Charlotte at bay. Asked what was going through his mind in those late moments, Embiid said with a smile: "Gotta make them. They call me Clutch for a reason, so gotta make them. "In practice they call me Clutch. I've still yet to show it in a game; tonight I felt like I did a better job of that, but that's my job. I've got to step up when there's an opportunity. "I can use power, I can use finesse. Last year in the last-minute situations I struggled a lot, and I feel I've been doing a better job. Still got a lot to show and still got a lot to improve on, so I'm excited." Philadelphia coach Brett Brown felt comfortable depending on Embiid to make his free throws at key moments down the stretch. "He's a really good shooter anyway, and he's confident by nature," Brown said, "so that's a pretty good collision of skill and mind that you trust him going to the line and shooting a high percentage. He's not afraid of the moment."